Surprises are always welcome, especially delicious surprise food items coming through the post. This month, we have been enjoying the contents of the October edition of Degustabox. We have been working with Degustabox from the beginning of the year, and each month we are sent a lovely delivery of around 9 to 14 items from well-known brands and new brands directly to our doorstep. Have a look what we have tried so far: January Degustabox, February Degustabox, March Degustabox, April Degustabox, May Degustabox, June Degustabox, July Degustabox, August Degustabox and September Degustabox. 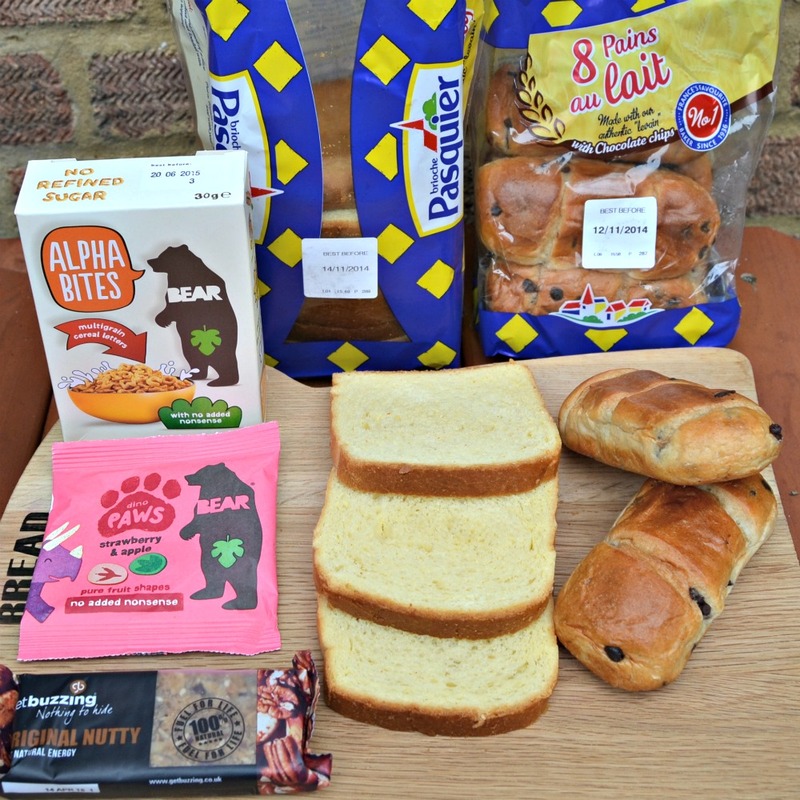 We were pleased to see Brioche Pasquier again, this time we were sent Sliced Brioche Loaf and Pain au Lait with chocolate chips. They are both delicious and perfect for breakfast or as a tasty snack. I was planning on making a brioche bread and butter pudding, similar to the Pain au Chocolat Bread and Butter Pudding Recipe, however they were gone before I had the chance to bake with them. Little man really likes Bear Paws, pure fruit snack in strawberry and apple flavour, with no added sugar. They are tasty and healthy snacks! There was also a sample present, a box of Bear Alphabites, playful cereal letters made with five grains and coconut blossom nectar. Little man was pleased to see Bear Alphabites again! We have used them previously in our Pinepple Aphabites Cereal Pancake Recipe and it was delicious. Get Buzzing Original Nutty is a 100% natural healthy eating flapjack, perfect for when you want a delicious treat that is healthy at the same time. We are big fans of sweet chilli sauce, it goes really well and fishcakes, salads and pasta. Blue Dragon sweet chilli sauce can be enjoyed on its own or added to recipes. We were pleased to see two bottles in this month’s Degustabox, I’m sure they will be gone before we know it. Kent’s Kitchen is another brand that we already know. Their handy meal kits are great when you fancy a quick meal and need some inspiration on what to make. We received Bengal meal kit, with sauce, herbs and oil pot. You simply need to add fresh ingredients following the suggested recipe on the pack for a delicious and quick family meal. 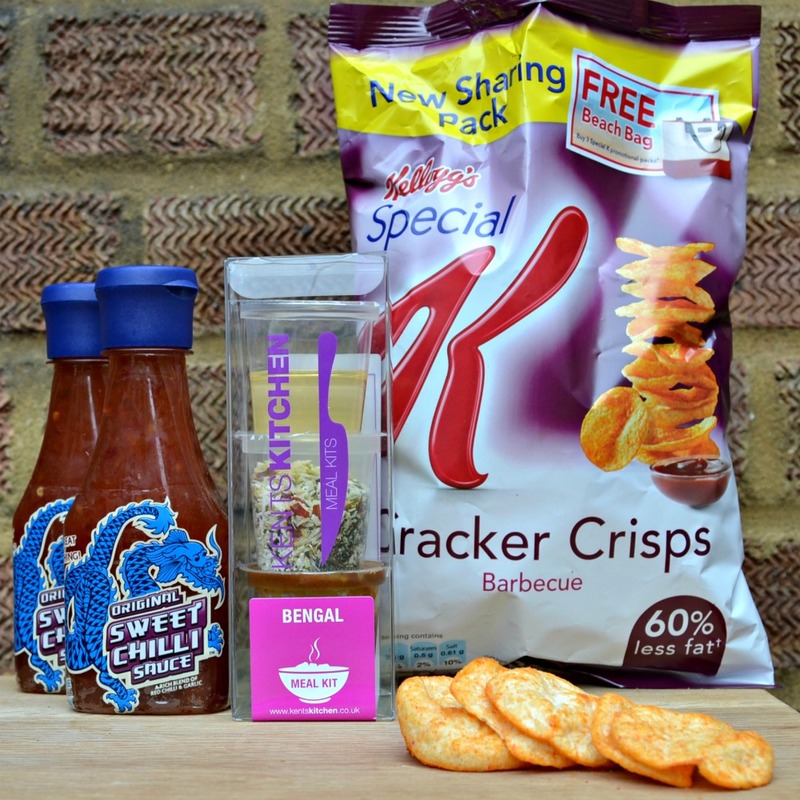 We first tried Special K Cracker Crisps a couple of years ago when they were first launched. The new barbecue flavour is delicious and a great addition to the range of delightfully thin crisps with 60% less fat than standard crisps. They are full of flavour and you won’t even notice they are a healthy option! Now on to the sweet options. 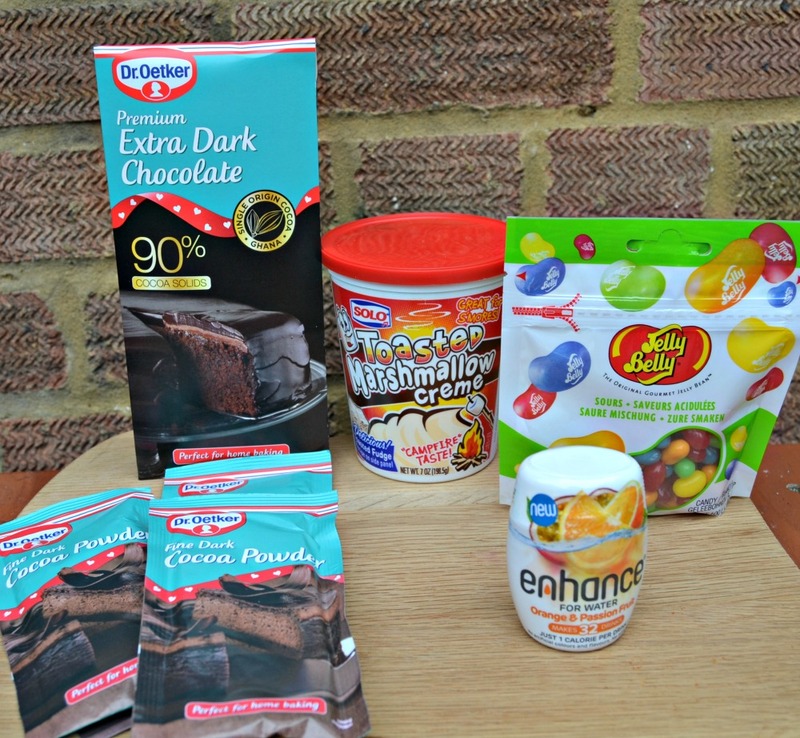 Dr Oetker Premium 90% extra dark chocolate and fine dark cocoa powder will be used soon in our baking sessions. I can already imagine a lovely chocolae cake using them, something similar to Chocolate Coca- Cola Cake Recipe or Sweet Potato Chocolate Cake Recipe. Perhaps I could make a chocolate marshmallow cake using Solo Marshmallow Creme? The spreadable toasted marshmallow cream is suitable for baking or enjoyed on its own. We were all excited when we saw Jelly Belly, it is exciting discovering new jelly bean flavours, made from finest ingredients. Yum! This month, there were no bottles of drink, however we received Enhance Drinks, a concentrated drink in orange and passion fruit flavour, made with real fruit juice with no added sugar. It is designed to transform water into a refreshing light fruity drink, and it is perfect to help us drink more water during Autumn/ Winter. There was also a voucher for Benecol Greek style,. I haven’t had the chance to redeem it yet, but I am looking forward to using the Degustabox Fridge voucher soon. Overall, we are pleased with the selection of this month’s box. It had a lovely range of delicious food items. If you haven’t tried Degustabox before, you can use the code GXWT0 to receive a £3.00 discount when registering. 10 Responses to "Degustabox October Edition"
It seems the Degustabox contains a lot of foods I’d enjoy. I love sweet chilli sauce, and those fruity snacks seem great too. While some of the items look great i’m not sure i would buy everything in the box which puts me off a bit – i don’t really want water enhancer. i know this is a way of trying things that you may not normally pick off the shelf but i would worry some of it is just padding.